What Do You Do for a Baby with Cavities? The baby teeth are quite delicate and can be damaged easily by sugars and acids, especially if proper infant oral care isn’t practiced. Poor brushing and flossing, plus other habits, can lead to cavities in the baby teeth when infants are still small. Learn these signs of cavities in the baby teeth and what you should do to stop the decay before it spreads! Decay can happen as soon as the first tooth appears in the mouth. Cavities can cause tooth erosion, craters in the teeth, sensitivity in the teeth, toothaches, infections, abscesses, discoloration and tooth loss. Severe cavities will turn the teeth gray, then black, especially in the baby teeth. 42% of children 11 and under have cavities. 28% of those 5 and under have cavities and 51% of 6-11 year-olds have cavities. The rate of untreated tooth decay in this age group is between 20% and 24%. 59% of 12 to 18 year-olds have had cavities, with about 20% of those cases being untreated. By adulthood, about 92% of people have had cavities. This is especially true of people between 20 and 64 years old. Gum disease is closely associated with cavities, but is a disease of the gums. Children can have this disease if they don’t have proper oral hygiene. Oral health issues and diseases can be avoided—as well as tooth loss—if a person is brushing and flossing their teeth and seeing a dentist as they should. Many parents don’t know when the teeth come in for babies unless they have had a child before. This often leaves parents constantly waiting for that first tooth to come in. However, we do know that most babies begin to get their first tooth between 6 and 12 months. Depending on genetics, an infant can get a first tooth at 3 months or they may be more than a year old without any teeth. No matter when your infant gets their teeth, you want to do all that you can to help them avoid cavities. That means you start oral care (like brushing) as soon as the first tooth comes into the mouth. One of the biggest culprits of cavities in babies is “baby bottle tooth decay”. This is the decay of the baby teeth due to sugars in milk (breast, formula and regular milk), that generally comes from a bottle. When the baby teeth are exposed to sugars (like in milk), those sugars act like acid on the teeth, decaying them. If infants are put down for naps or at night with bottles, sucking on the bottle periodically can expose the delicate baby teeth to sugars over and over. This can quickly lead to cavities in the baby teeth. Placing sodas, juices or other sugary drinks in bottles or sippy cups can also cause the same decay and damage to the teeth. Never put anything but water or milk in your infant’s bottles or cups. Wipe the gums and teeth off with a damp cloth after feedings and never place your infant down with a bottle for naps or bedtime. When there is a tooth in the mouth, always brush that tooth (or teeth) twice a day with a tiny amount of baby fluoride toothpaste. The process of getting the baby teeth is known as “teething”. This is not the creation of the baby teeth, but simply when the teeth start to poke through the gums. Teeth are formed while in the womb and lie deep in the jaw bones. Over time, the teeth will shift down, eventually poking through the gums. Teething can be hard on little ones and can cause swollen, tender and sore gums. An infant may be irritable up until age 3 because of these incoming teeth. The American Dental Association recommends that every infant see a dentist within the first 6 months of getting their first baby tooth. After that time, an infant should continue to see the dentist biannually (meaning every 6 months) for routine dental exams and cleanings. 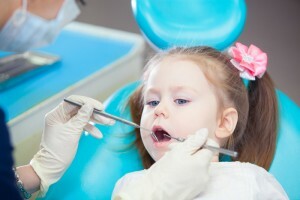 Your child may not need a thorough dental cleaning until they are older, but the exam is very important. Dental problems are best fixed when they are caught early-on. This is because the primary—or “baby”—teeth play a crucial role in dental development. 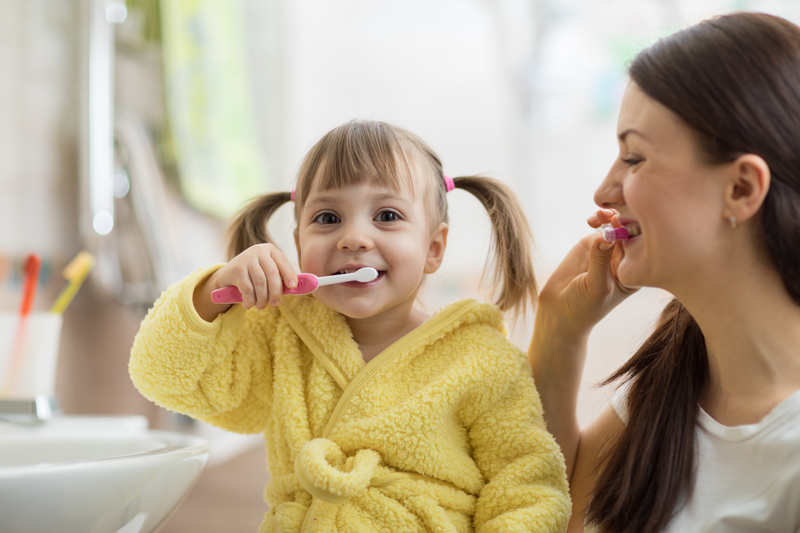 Brush your infant’s teeth at least twice a day, especially before bed. Use a rice-sized amount of infant fluoride toothpaste and brush your baby’s teeth up to 2 minutes, depending on how many teeth they have. Floss your infant’s teeth once they come in and are close enough together that flossing is needed. Flossers are great tools to help small children learn how to floss. If your infant or child is prone to cavities, ask your dentist about dental sealants. These are thin, plastic coatings we can paint onto the baby teeth to protect them from decay. If you infant does have cavities, we will do all that we can to correct the tooth decay. There are cavity treatment options for small infants. One of the best options is laser dentistry, which is method of removing tooth decay with laser light. This is a virtually pain-free way to remove decay, where the tooth area is then filled with composite resin to restore the tooth. You want to do all that you can to avoid cavities in the baby teeth. Much of that prevention will come from how well you take care of your infant’s teeth. When cavities do happen, we can work with you to help make your infant’s teeth healthy once more so no permanent dental damage happens. For all of your questions about cavities in the baby teeth, call Dr. Evanson’s office at (720) 409-0008!